LUSAKA –10/04/2015: The news about the passing-on of the late Rev Violet Sampa Bredt on 29th March 2015 gripped the hearts of many Zambian Christians with sadness. She passed on in Germany after being sick for some time. The body was flown into Zambia via South African Airways. 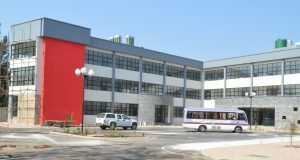 On Thursday, 9th April 2015 members of the United Church of Zambia led by the General Secretary Rev Dr Mulambya-Kabonde, family members and the Council of Churches of Zambia officers, led by CCZ General Secretary Rev Sussane M.Matale, gathered at Kenneth Kaunda International Airport to receive the body. Prayers were conducted by Rev Col. Henry Matifeyo who was the worship leader and the homily was given by Rev Dr B.S.Chuba. The church service was conducted on 10th April 2015 at UCZ St Paul’s Congregation in Lusaka at 09:00hrs. 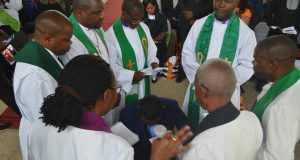 The Church service was led by Lusaka Presbytery Bishop the Rev Mwape R. Chomba. The United Church of Zambia Synod Bishop His Grace the Bishop Rev Mutale Mulumbwa gave the homily. 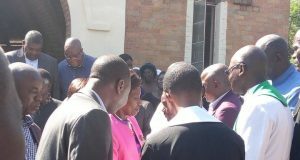 Among notable mourners were the First lady Esther Lungu, Government officials, Ministers, politicians, a representative to Her Excellency the Former Vice President of Uganda Specioza Wandira Kazibwe, Rev B.S. Chuba, Christians and many others. Burial took place at the family home in Makeni. The late Hon Rev Violet Sampa was born on 27th October 1950. She was one of the first female ministers to be trained by the United Church of Zambia. She was in the same class with Rev Dr. Bwalya S. Chuba. Due to her hard work she was sent abroad for her studies in Germany were she also met her husband. After training she came back home and served in her church. She was later seconded to the Council of Churches in Zambia as its General Secretary where she served for many years before taking up a political career. She was very instrumental in the establishment of Makeni congregation. She left behind a husband and children (Kabengele, Mukuka, Nsama and Mwamba).